The Hoosier Auditions is an exciting statewide event in which your students are able to perform in a competitive setting in one or more of the following instrumental categories: Strings, Winds, Piano, Voice, and Piano Duet. There are two rounds of the Hoosier Auditions – District and State. Students receive a written performance evaluation from expert judges in the field. Winners of the District round are invited to compete at the state round. Winners of the state round receive cash awards, plus an opportunity to perform at the annual IMTA State Conference. Some students may want to participate in the Hoosier Auditions and receive comments from judges, but do not wish to compete. These students may declare themselves ineligible to win by checking the non-competitor box on the entry form. For questions regarding Hoosier Auditions, please contact Daniel Lin, Hoosier Auditions Chair. Audition dates and entry deadlines vary depending on the district. Find a district map and detailed information on the district rounds here. Fees are the same for both district and state rounds. Entry fees for piano duet are split between the duo. All fees are non-refundable. Hoosier Auditions provides an educational experience for students and teachers through opportunities to perform in a competitive (or non-competitive) setting, to hear other competitors perform, and to receive a written performance evaluation. There are two rounds of the Hoosier Auditions – District and State. There are nine District Round sites across the state held in March or April. Please see the District Map to find your district. The winner of each level in the District Round advances to the State Round, which is the final round of the competition. Requirements for the State Round are identical to those of the District Round. Contestants need not perform the same pieces they played in the District Round. Students may enter in one or more of the following instrumental categories: Piano, Voice, Strings, Winds, Classical Guitar, and Piano Duet. Students have the option of participating at the District Round as a non-competitor, only to receive comments from the adjudicator. These students may declare themselves ineligible to win or place in the competition by checking the “non-competitive status” box on the entry form. Non-competing entrants pay the same fees and are subject to the same requirements as competing entrants. Students of current IMTA members and non-members who reside in Indiana or within a 50-mile radius of the state borders are eligible to enter. Non-member teachers are required to pay a one-time fee of $75 each year which entitles the teacher to enter any number of students. Teachers may accompany their students at both the District and State Round. Recorded accompaniments are allowed at the District Round ONLY. Students are required to bring their own accompanist. Unaccompanied instrumental pieces may be performed in solo format. Students enter a level based on their age as of March 1 of the same year of the competitions they are ending. Duet entries should enter based on the age of the oldest student. Contestants are not limited to specific repertoire but do have time limits—see below. A list of repertoire performed within recent years is available from your District Chairperson. 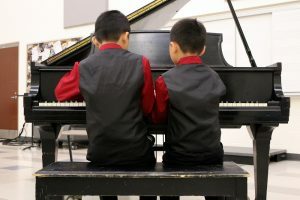 At all levels other than the Collegiate level, memorization is required for piano and voice; it is optional for all other instrumentalists and piano duettists. Pianists and piano duettists are not permitted to perform arrangements, simplifications of repertoire, concerti, or any other two-piano piece. Students must provide one copy of each audition piece for the judges. No names of persons, libraries, schools, etc., may be visible anywhere on the judge’s copy. It is not necessary to erase teaching marks. No photocopied music is to be given to the judge or used by an accompanist or soloist without showing written permission from the publisher. Soloists and accompanists may, without written permission, photocopy passages for use with the printed score to facilitate inconvenient page turns. Pre-Early Elementary (ages 5-6) non-competitive – Two or more contrasting pieces, not to exceed 4 minutes. Early Elementary (ages 7-9) – Two or more contrasting pieces, not to exceed 5 minutes. Elementary (ages 10-11) – Two or more contrasting pieces, not to exceed 6 minutes. Middle (ages 12-13) – Two or more pieces by composers from two contrasting historical style periods, not to exceed 8 minutes. Junior (ages 14-15) – Two or more pieces by composers from two contrasting historical style periods, not to exceed 10 minutes. Senior (ages 16-18) – Two or more pieces by composers from two contrasting historical style periods, not to exceed 15 minutes. Collegiate (undergraduate ages 18 and over) – Maximum audition time is 20 minutes. Piano: pieces must represent three style periods. Memorization of all pieces required. Voice: an Italian art song, a French or German art song, a 20th-century work in English; Minimum time requirement of 15 minutes; Memorization of all pieces required. Strings: pieces must represent three style periods. Memorization of at least 1 piece required. Winds: pieces must represent three style periods. Memorization of at least 1 piece required. Classical Guitar: three pieces in contrasting styles. Memorization of all pieces required. Piano Duet: pieces must represent three style periods. Memorization of at least 1 piece required. *For historical style period verification, click here . At both District and State levels, adjudicators will declare a winner and an alternate for each level of performance EXCEPT in the district round for Pre-Early Elementary as it is non-competitive. Ties are not possible and the decision of the judges is final. Judges may also declare Honorable Mention(s). The winner of each District Round will advance and compete at the State Round. Winners of the State Round will receive a cash award as listed, plus the opportunity to perform on a recital at the IMTA State Conference in the fall following Hoosier Auditions. Awards for piano duet are split between the duo. In the event that a winner is unable to perform at the winners’ recital, the alternate in that level will be invited to perform. A student who wins the State Round at a particular level may not enter the following year at the same level in the same instrument category. A student who wins the District Round at a particular level but does not win at the State Round may compete again at the same level the following year if age eligibility permits.